Continuous Integration (a.k.a. CI) is a software engineering process. It can be defined as running an automated test suite on every commit to a software project and notifying on success and failure. CI is beneficial as it greatly increases the feedback developers receive on each commit, and the health and well-being of the software overall. It is amazing how many bugs can be found which otherwise would remain covered due to particulars of development environments. The faster your team gets feedback on bugs and regressions, the sooner your release is ready! At a high level, Continuous Deployment (a.k.a. CD) extends Continuous Integration to include automated deployment. This can vary from full “deploy-on-green” whereby the system is automatically deployed to production every time the tests pass, to more conservative automatic deployment to staging with a manual push to production. Continuous Deployment typically includes a notion of “feature flippers” which enable new features to be rolled out gradually, to a subset of customers, or quickly toggled off if they cause issues. CD makes the software release feedback loop as tight as possible. We believe that Continuous Integration and Continuous Deployment processes improve the quality and reliability of software. We want to make these processes more accessible, and one of the main blockers is well-designed, high quality CI and CD tooling. By choosing sane defaults, automating to the extent possible, and minimizing extraneous UI, Strider can elegantly meet the needs of 80+% users out of the box. However we realise that in the real-world, integration with other systems and customization is often required. For this reason, Strider has been designed from the ground up to be as easy as reasonably possible to customize and extend - in very powerful ways. Strider has robust support for extensions (which are simply NPM modules). Have a complex workflow to trigger builds and deployments? Write a Job plugin to handle it. Use an unsupported VCS? Write a Provider plugin. Strider integrates with Github, Github Enterprise, BitBucket, GitLab and more. Intuitively add projects for CI and CD with only a few clicks. No messing with scripts or SSH keys - Strider does it for you. Notification on success and failure. Emails work out of the box to notify humans, Webhooks supported for notifying machines. Want a custom notification method? It’s easy to develop a plugin. Development teams via “collaborators”. Give other users read-only access or full admin rights to your projects. Let the world at large see your project status dashboard! Public projects may be browsed by anonymous users, but not triggered nor configured. Great for Open Source projects. See Strider’s public CI dashboard at https://public-ci.stridercd.com. Each VCS branch may be configured independently, including different deployment configuration. Use this to create powerful workflows. For example, “master” branch may only deploy to production with a manual trigger while “testing” branches deploy to QA automatically on each successful test run. GitHub pull requests can be automatically tested when they are opened, with test result status sent back to GitHub to mark the PR. For security reasons, this is only enabled for specific users which you whitelist. Script each phase of each project from the web or config file. Custom prepare, test and deploy scripts easily enable integration with your specific language, environment and existing automation. 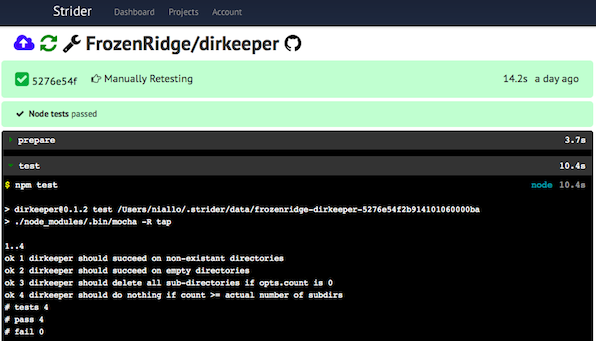 Deploy directly to Heroku apps with the strider-heroku plugin. Out-of-box support for Node.JS and Python projects. Other languages / environments can be supported with thirdparty plugins or custom scripts. 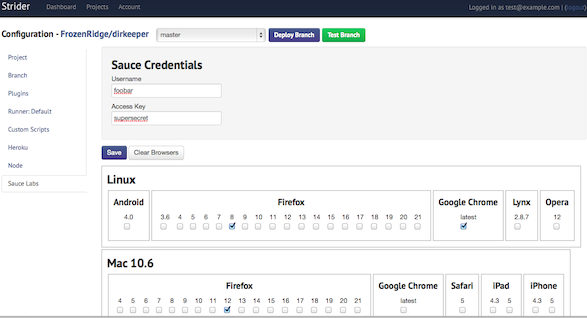 Easily configure SauceLabs.com credentials and select os/browser combinations via Strider’s web UI. Strider will even manage the Sauce Connect proxy for you - waiting for it to be connected before running your tests. Strider is designed to be highly extensible. The core is minimal, with most features implemented in plugins (e.g. strider-heroku, strider-github, strider-sauce). In keeping with Node.JS, Strider plugins are simply NPM modules. This makes it easy to support new VCS providers, deployment targets, languages or environments and so on. See the chapter on Extending Strider for more! FrozenRidge, LLC provides commercial support including training, customization/integration and cloud-hosting. Email hi@frozenridge.co to learn more.